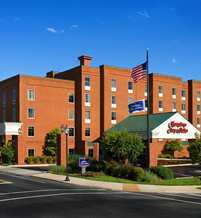 Location/ Directions: From I-64: take Exit 120 and take 5th Street heading north for 2 miles, turn left on West Main Street, follow 1/2 mile and the hotel is on the left between 9th & Roosevelt Brown Streets. About Hotel: 5-Floors, 100-Rooms,Interior Corridors, No Pets Allowed, Easy to Set Alarm Clock Radio, Coffee Maker, Complimentary Hot Breakfast, High Speed Internet-No Charge, Iron/Ironing Board, Lap Desk, Coin Laundry, Elevators, Laundry/Valet Service, Local Area Transportation, Luggage Hold, Multi-Lingual Staff, News Stand, On-Site Convenience Store, Business Center, Fitness Room, Cribs, High chairs. Railroad View: Excellent View of the CSX single track. Good / Excellent View of the Norfolk Southern / Amtrak line. Motel is near the diamonds and walking distance to the Amtrak station. Motel has a driver that will shuttle you to/from the train station. Railroads past Hotel: CSX / Norfolk Southern (former Southern mainline) / Amtrak. 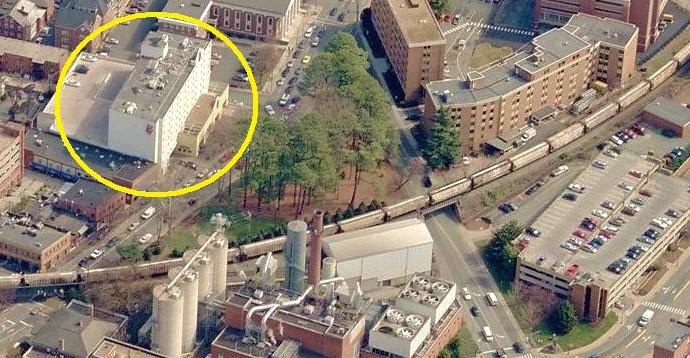 Photo Comment: The aerial view show the Hampton Inn circled in yellow, with the Amtrak train station marked in blue. The Norfolk Southern line is the double track that passes under the bridge. The CSX line is a single track that is seen closest to the motel. Location/ Directions: Route 29 South; Continue as Route 29 South / Emmet Street. Motel on Left at the University. 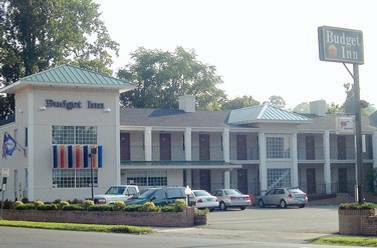 About Hotel: 2-Floors, 38-Rooms, Exterior Corridors, Complimentary Continental Breakfast, Wireless Internet, Local & Long Distance Calls (USA & Canada), Individual AC / Heat, 32’ LCD Cable TV, Wireless Internet, Iron & Iron Board, Hair Dryer. Railroad View: Excellent View. Motel is located next to CSX line. The only gripe is, the motel doesn't have any rooms with windows that face the railroad directly. Some rooms on the back side (east side) of the motel will offer an angled view of the railroad. These are the needed rooms for a railroad view from this motel. Railroads past Hotel: CSX. One guest reported 3 coal train's past during his quick one night stay. Expect less then 10 trains during a 24-hour period. Photo Comment: The aerial view faces north. 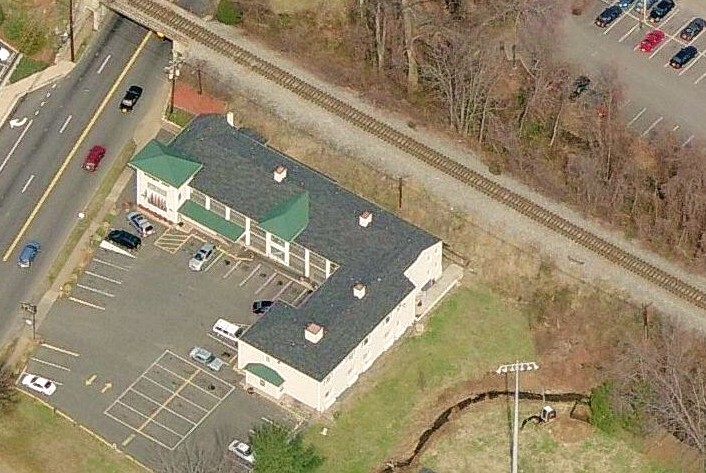 The motel is directly next to the railroad, however, the only rooms with windows that overlook the tracks are the windows you see in this picture, on the east side of the motel. Otherwise its a dash out to the street to watch them go over the bridge. Free Expanded Cable TV, Complimentary Coffee, Alarm/Clock Radio. Railroad View: Fair to Poor view due to tree's. Get a room on a high floor on the front of the building to have a railroad view. Railroads past Hotel: CSX (ex. C&O Line). Not a busy line. Expect less then 10 train's during a 24-hour period. Coal & Grain train's dominate. Photo Comment: A CSX grain train is seen passing through Charlottsville on their single track railroad. The Red Roof Inn is the building circled in yellow..the one with the gray roof, go figure (ha-ha). Due to tree's across from the motel the railroad view isn't too good. But angled views looking down the street to the railroad overpass make a view possible.